Hello! I've been dying to make one of these awesome Snow Globe cards, so I finally sat down yesterday and did it! Aren't they cool! I also used another Digiment that will be released tomorrow! I seriously LOVE these Christmas song Digiments! Michelle is offering a super special deal tomorrow~All 24 Digiments For $8.00!!! Get a second set for only $4.00 and send them to a friend! That totally rocks!!! Also, make sure you go by the Digiments blog and leave a comment because one commenter will win the entire release! For my card I used my PTI Tree Trimming Trio set. I punched the snowflakes with my Martha Stewart punch, and used retired Ski Slope DSP from SU. This also qualifies for this week's Saturday Spotlight Challenge to use an image more than once. 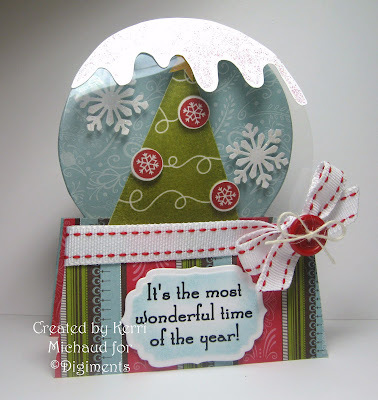 I stamped the ornament image 3 times : ) I'm definitely going to make more of these! Thank you so much for stopping by today, and have a fabulous weekend! Oh Kerri!! I just love your snow globe!!! Your dp, colors, and image are perfect!! So elegant and beautiful!! One of the best snowglobes I have seen out there. You are inspiring me to give it a go. what a cute Idea! I love the snowglobe look. Too cute! Love every thing about this globe and like how nice the colors match! You DID it girl! This is AWESOME! I don't have enough confidence yet to attempt one of these...besides I need to get some acetate paper, LOL. What gorgeous DP's, ribbon and I love the snow on top...way cool! Great card Kerri, the shape of the card is super! Wonderful. So gorgeous Kerri! I'm loving the snow globe shape! This is gorgeous, Kerri! I love that nesties shape for the sentiment, and patterned paper is fabulous. What a fun card. I haven't used this tree yet, I find it a little challenging to use. I love what you did with it here. WOW WOW WOW Kerri LOVE your snow globe....What fantastic colors...The perfect sentiment and love the ice on the top, soooo creative!!! Ohhh my goodness! I don't want to know how you made this, I don't care, I just want to enjoy this fantastic card!! How fab is this!! I haven't seen these around....so glad yours is the first I've seen...love the colors...and the ribbon....ohhh it's awesome, Kerri! AWESOME Kerri!!! I love your snow globe card!! !